Dutch prog masters Ulysses based 'The Gift Of Tears' on a simple premise: 'Why use fiction when the world already has so many stories to tell?' On their third release, Ulysses brings their impressive musical and lyrical skills to bear on the stories of life. What develops throughout this album can only be described as authentic tragedy in the Greek sense of the word. The music is most often dark, brooding and melancholy; we're not looking at 'the bright side of life' or 'happy shiny people' here. If your personality lends itself to the downside of mood swings or you're just feeling blue, I do not recommend you spin this disc. Wait for a better day for this is intense music and subject matter. As mentioned, the melancholy motif of the music fits the tragic content. New vocalist Michael Hos adds to this mood with his straight forward, no-nonsense, yet passionate delivery. He seems to draw despondency from most every word as found in 'Family Portrait' and 'Anat.' Even with the help of female background vocals on the former, it does not take away from the sadness inherent in the song. The dark moodiness is most apparent on 'How Much More' with it's heavier riffs and even heavier lyrical content, and on the epic tragedy 'Anat,' a heartbreaking tale of a young couple losing their child to a brain tumor. 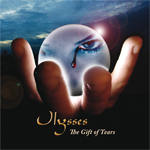 Musically, even with the deep and foreboding content of the lyrics and music, Ulysses delivers their best compositions and performances on 'The Gift of Tears.' Thinking on these terms alone, the whole album is consistent. But Ulysses is especially brilliant on 'Family Portrait' (great keyboard and guitar solos), 'Guardian Angel' (huge keyboard and guitar duet at the end) 'Lost' (impressive arrangement with thick riffs and stinging fret work) and the grand 'Anat,' which is worth the price of the album alone. Both immense and profound in scope, Ulysses' 'The Gift Of Tears' is a moving and melancholy musical tragedy revealing life as it is (not as we are told it is or should be). Take time (and care) with this work for it will pull deeply at your heart and soul.